Lazy TD Performance Horses mission is to acquire, breed, train and show extraordinary reined cow horses. Our horses are AQHA And APHA Registered and have extraordinary bloodlines that produce the most mentally and physically balanced horses. Founded in 2012 by Tamara Casey and David Serna, Lazy TD Performance Horses is dedicated to breeding, training and showing exceptional reined cow horses. We believe there is no finer equine athlete than the reined cow horse. Reined cow horses must be versatile as they compete in three equally challenging events: Cutting, Reining and Fence Work. They must possess incredible endurance and longevity, which is why we focus principally on the American Quarter Horse breed, which was developed specifically for this type of work. Nevada’s Great Basin has been home to exceptional horsemen for more than 100 years. The sprawling ranches of the region are numerous and often cover less than hospitable terrain. The farmers and ranchers of Northern Nevada have always prided themselves on the development of extremely capable equine partners, which they rely on heavily for daily work. 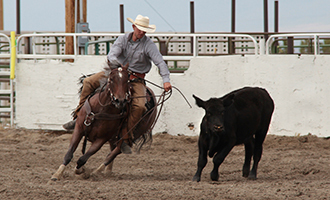 Showing off this talent at local competitions is extremely popular and has paved the way for a vibrant reined cow horse community of breeders, trainers and competitors in the region, which is why Lazy TD Performance Horses has made the Great Basin its home. It takes an extraordinary horse to compete at the highest levels in reined cow horse competition. We focus on carefully determining the bloodlines, personalities, performance records and conformation required to breed champions. However, preserving the breeding heritage of the Great Basin is also very important to us. The bulk of our horses are from this region or surrounding areas.